Make a greeting card using 4 x 4 (small) embroidery design in a 120 x 120 hoop. 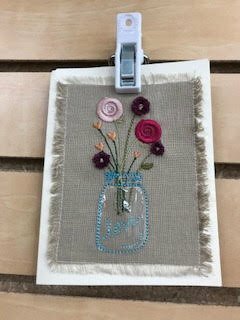 You will learn how to make fringed flowers and vinyl Mason jar applique. Embroidery files available with medium and large designs for making a canvas tote and tea towel. Greeting card files & instructions will be provided at first class.